If you have an extensive game library for your PlayStation 4 Pro, you may be thinking about increasing the size of your PS4 Pro's hard drive (and thus, your game library). If you've never tinkered with a game before, do not worry. Sony makes it fairly easy to remove and replace your hard drive, as well as restoring your data to a new hard drive. And we're going to run you through all the steps to make it even easier. .1GB of available storage for the system reinstall, a separate computer, your controller's charging cable, and finally, a USB drive with enough space to back up all your games, saved data, user accounts, and themes. From the PS home screen, navigate to "Settings," then scroll down and select "System." Scroll down until you reach "Back Up and Restore" and select it. On the next screen, select "Back Up PS4." You should arrive at a screen. Insert your USB drive [make sure it has enough space to facilitate the data migration]. 19659011] You can also deselect or select individual games and demos by choosing "Applications" from the list. Once you've settled on what to back up , select "Next." You'll see the size of the backup file, and the name of the backup (which you can edit, if you want). Once you're done, select "Back Up." Now you wait. 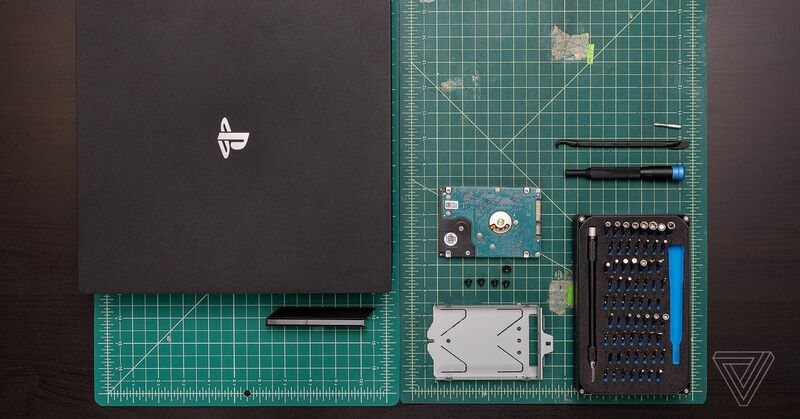 The PS4 Pro wants to transfer the files to the connected USB device, shut down, and then reboot in a few minutes, completing the backup process. Using a separate computer, head to Sony's website to download the PlayStation 4 Pro's system software. For some strange reason, Sony gives its update and system software the same file name, which is confusing, to say the least. Make sure you scroll "How to update." Click on "Perform a new installation of the system software" and look for "Download now." You should be downloading a. PUP file that's approximately 820MB (an update file, which is probably not, will probably be smaller). On your computer desktop, create a folder entitled "PS4" (case sensitive). Inside your new "PS4" folder, create another named "UPDATE." only use capital letters. Drag and drop the system file you downloaded earlier (do not rename it) into the "UPDATE" folder. Insert your USB drive into your computer. Drag and drop the "PS4" folder to your empty USB drive. Keep your USB drive with the files in a safe place. You'll need to restore your PS4 Pro after you install the new hard drive. Completely power off your PS4 Pro by holding down the PS button on the DualShock 4 controller, scrolling down to "Power," and selecting the option to shut down. Unplug all cables, including the power jack, from the unit. On the back, left-hand side of the console, you'll see a hard plastic cover. Apply moderate force to the cover and pull it off. Using your Phillips-head screwdriver, loosen the PlayStation-branded screw that keeps the hard drive locked in place. Save it in a safe place; you'll need it during reassembly later. Gently pull the tray out of the console. Next, using your Phillips screwdriver, unscrew the four screws holding the hard drive in the tray. Take your new hard drive and place it in the tray. Align the four corners of the drive with the holes in the tray. With the last and largest screw, secure your new drive to the PS4 Pro's chassis. Turn your PS4 system completely off (so it's not in rest mode, but a full shutdown). Make sure the power indicator is not lit. If it is, touch the power button for a second time. Take the USB drive on which you saved the PS4 system files and insert it into any of the PS4 Pro's available USB ports. Touch and hold the power button for at least seven seconds, until the PS4 Pro starts in safe mode. Connect your DualShock 4 to the console using a Micro USB cable. Press the PS button on the controller, then select the option "[Initialize PS4 (Reinstall System Software)]" by pressing the "X" button. PS4 to unpack, install, restart, and come to an initialization screen, just as you are powered on the console for the very first time. Side note: If your PS4 system does not recognize the update file, double check the folder name (which should be in uppercase letters) and file name of the update (which you should not have changed). Make sure you use the .PUP file, and that you are using the correct system software and not just an update file. If you've gone through the steps correctly and smoothly, you should now have a look at your PlayStation account. Skip the most of it (PS) home screen. Insert the USB drive with your backup files. Navigate to "Settings," scroll down to "System," then move down and select "Back up and Restore." Select the "Restore PS4" option. Once you've arrived at the "Restore PS4" screen, you should see your backed-up files on the inserted USB drive. Select the backup. You'll be taken to a confirmation screen. Take the warning screen, then select "Restore." Do not remove the USB drive or shut down the system for any reason. At this point, the PS4 Pro system should shut down, apply the update, restart, and – if all goes well – display your original home screen, with your accounts, games, captures, saves, and the like. Congratulations! You just expanded the storage of your PS4 Pro and kept your files intact in the process!